Known for its great brewery feature events Blind Tiger Ale House ushered in Halloween with a costume contest / party featuring some of Avery Brewing Company’s (Boulder, Colorado) best beers. One of my favorite things about their events in that they let you order 6oz glasses (“half pour”) instead of having to order a full glass of every beer that you want to try. This came in handy at this specific event because the overwhelming majority of the Avery beers being poured were quite high in ABV. Old Jubilation (Old Ale, 8.3% ABV) – This and the next beer are the first two that I ordered upon grabbing a seat at the bar and looking over the beers on tap list. However, I failed to pay close enough attention when the bartender pointed out which one was which. So it wasn’t until later in the night while talking to some fellow beer geeks that I asked the bartender for a taste of each of the two beers to check if I mixed them up in my tasting notes and I indeed did mix them up. Getting to the beer in question. It poured ruby red in color with no head to speak of. It’s aroma and flavor were quite simple in that after a few sips berry and raisin notes dominated and left only subtle notes of molasses, caramel, hazelnut, and earthy hops in the finish. To its credit the alcohol content was hidden quite well and with a medium body I found Old Jubilation to be quite drinkable. For now I’m going to rate this beer a 5.5/10 for its lack of complexity and wow factor, but I’d like to buy a bottle at some point to see if my initial impression of this beer will change. Samael’s Oak Aged Ale (2011 vintage, English Barleywine, 15.3% ABV) For quite a while I’ve wanted to try the beers in Avery Brewing Co.’s Demons of Ale series, but it wasn’t until this event that I actually did so. It is this series that highlights a major reason why I respect the brewers at Avery. Year and year out they’re able to maintain yeast strains that are able to ferment such high gravity beers without causing big fusel alcohol notes that have a negative affect on one’s drinking experience. While this 2011 vintage still packed a punch from it’s 15.3% ABV, the alcohol heft and heat did not detract from my enjoyment of this well-crafted beer at all. With a deep amber color and resilient off white head this big barleywine’s complexity was practically jumping out of my glass. Its sweet vanilla, toffee, caramel, and oak notes reminded me quite a bit of Firestone Walker’s Double DBA…As is the case with lots of other full bodied oak aged beers, the flavors didn’t change a whole lot as I slowly savored my 6oz serving, but the way they all came together with each sip was what made me really enjoy my drinking experience. Rating: 8.5/10 – for great flavor and perfect amount of alcohol heft / heat after two years of aging. The Kaiser (2010 vintage, Imperial Octoberfest, 10% ABV) Being that I have a sweet spot for the sweeter German beer styles, the Octoberfest / Marzen is one of my favorite beer styles to drink during the Fall and Winter months. 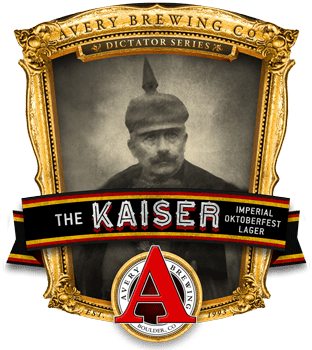 As an “imperial octoberfest”, The Kaiser takes the sweet toffee and caramel malt flavors and noble hop character that this traditional beer style in known for and amps them up. In my opinion, the extra flavor and alcohol content make this version of the style a bit more versatile in terms of food pairings and occasions when it would be perfect to sit down and savor this “dictator worthy beer”. With 3 years of age on it the noble hop character was subdued, but present to the point of helping the malt character not become overly sweet as I savored the beer. So much so that upon my first sip I wrote down “definite intensified octoberfest”. With the alcohol toned down I was able to fully enjoy this beer’s rich caramel, toffee, and somewhat fruity malt character. Lastly, I should note that I did taste the 2013 vintage and its hop character made me even more confident in this beers versatility. Rating: 9/10 – I’ll definitely be seeking out a couple bottles of this one!! The Beast (2010 vintage, Belgian Strong Dark Ale, 16.21% ABV) After cleansing my palate I moved into my next 6oz glass of beer. 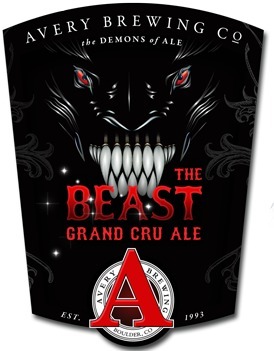 Beyond being excited to be trying yet another beer from Avery’s Demons of Ale series. This beer tickled my beer geek curiosity in that I wanted to see how well the Belgian base beer blended with the flavors contributed by the oak barrels it was aged in. With an attractive burgundy color and tan head (left some nice lacing on my glass) this vintage of The Beast retained its bold barrel character quite well. Like Samael’s Oak Aged Ale, the barrels contributed an abundance of vanilla and caramelized sugar notes which I remarked in tasting notes as being “barleywine-esque”. However, as the beer warmed up I picked up on the dark fruits, spice, and dryness that are common in Belgian Strong Dark Ales. So in the end I was left quite curious about how much Belgian / Grand Cru character is present in both younger and older vintages of this well crafted beer. Rating: 8/10 – Great beer to savor on a cold night…Just wish the base beer shined a bit more. Lilikoi Kepolo (Witbier, 5.6%, tap only) After starting off with a bunch of complex and high gravity beers I decided to try this new witbier which was brewed with passionfruit. As a lover of all things passionfruit I was quite excited to experience what a beer brewed with it would be like. 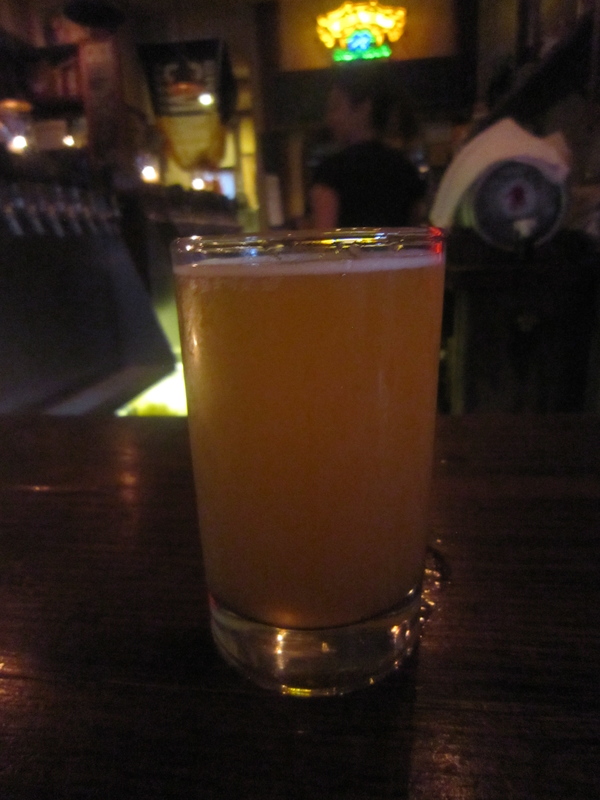 This fine example of a witbier poured hazy straw in color and was topped by a thin white. I attributed the haziness to both the wheat and passionfruit. After admiring the beer’s attractive appearance I took a deep whiff and was met with a burst of tart yet refreshing lemon, passionfruit, clove and wheat malt. It was on my palate that the passionfruit took over. Though it was joined by notes of ripe peaches and the the typical Witbier characteristics from the aroma. In the end it was more akin to a refreshing passionfruit juice drink, which for me was not an issue because as I mentioned earlier; I love all things passionfruit. Rating: 9/10 – I hope I can try this beer again! If you like passionfruit this is a must try. Rumpkin (2013 vintage, Imperial Pumpkin Ale, 18.53% ABV) Before I saw this beer on the chalk board behind the bar I didn’t know that this limited release fall seasonal beer was going to be available at this event. So once one of the bartenders started opening bottles I couldn’t resist paying the steep price for a 6oz pour of this highly sought after pumpkin ale. After spending 6 months in dark rum barrels the typical orange / deep golden pumpkin ale color was darkened and appeared amber in color. Upfront I was met with a fair amount of pumpkin pie notes (spices and actual pumpkin) and vanilla. At mid-palate I picked up additional sweet pumpkin, toasted nuts, and oak. Then in the finish the rum came into play with its sugary / molasses notes blending quite well with the pumpkin ale flavors…Summing Up: What I liked most about Rumpkin was how well the barrel character blended with and never overshadowed the pumpkin ale base and how well the high ABV was hidden. Rating: 8.5/10 – quite close to a favorite beer…Definitely my new favorite Imperial Pumpkin Ale. Cheers to Blind Tiger Ale House and Avery Brewing Company for a great event featuring some the most amazing and complex beers that I’ve had in a while!!! This entry was posted in Beer Reviews and tagged Avery Brewing Company, Avery Rumpkin, Avery The Kaiser, Blind Tiger Ale House, Imperial Octoberfest, Lilikoi Kepolo, old jubilation ale, passionfruit witbier, Samael's Oak Aged Ale, The Beast Grand Cru. Bookmark the permalink.